The women’s 4 X 400 metres relay team and Arpinder Singh will also be in action on Saturday, in their respective finals. 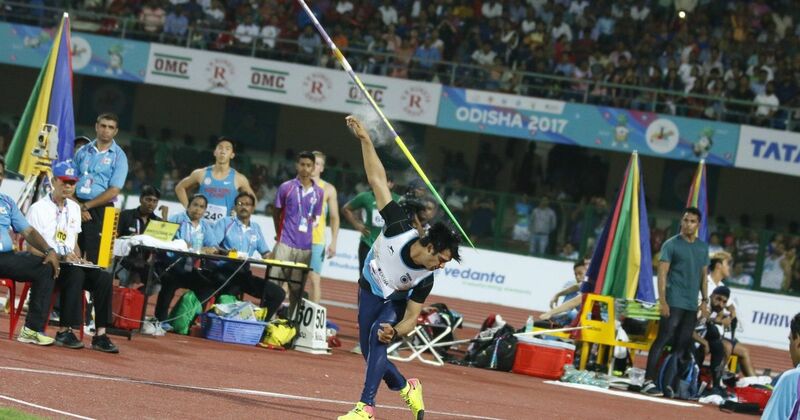 Javelin thrower Neeraj Chopra led the charge of the Indian athletics contingent at the Carrara Stadium on Friday. Faced with the task of clearing a mark of 78m to automatically qualify for the final of the javelin throw event, the 20-year-old needed just one attempt to fling the spear a distance of 80.42 metres. Chopra might have been able to exceed that mark but chose not to take the next two attempts in an effort to conserve energy for the finals. Chopra has a season’s best of 85.93 m recorded at the Federation Cup last month, while his personal best of 86.48 m recorded at the IAAF U20 World Championships is the current national record. Chopra wasn’t the only Indian to make it to the finals though. Teammate Vipin Kasana also made just one attempt at the javelin throw, clearing a distance of 78.88m. The result was a marked improvement compared to his effort at the 2014 Commonwealth Games in Glasgow. At that event, Kasana, 30, was only able to record a best of 71.95m in qualifying round and did not proceed to the finals. Neeraj’s throw wasn’t the best of the day. Four other throwers managed better performances than him. Hamish Peacock of Australia topped qualifying with a throw of 81.22m while Arshad Nadeem of Pakistan and Anderson Peters of Grenada were second and third with a throw of 80.45m and 80.44m respectively. Unlike Chopra and Kasana, those athletes didn’t have it easy. None of them managed to clear the mark of 78m in their first or second throws. Peacock had efforts of 74.58m and 76.49m. Pakistan’s Nadeem had a foul throw before recording a legal throw above the 80m mark. Peters of Grenada too kept his best for last with throws of 76.93m and 76.08m before clearing the qualifying standard. One shock absentee from the final is Kenya’s Julius Yego. The Olympic silver medalist and former world champion had a personal best of 92.72m and throw of 87.97m last season. The Kenyan had been out of form in the run up to the Games. Yego, only managed throws of 74.55m and 73.67m but failed to cross the qualifying standard. India also qualified for the final of the men’s 4x400m relay. The team anchored by Arokia Rajiv comprised Amoj Jacob, Mohammand Anas and K Suresh finished second in their heats with a time of 3.04.05 seconds, just short of top ranked Jamaica who crossed the finish line in 3.03.97 seconds. Bahamas finished third with 3.04.62 seconds. The other heat was won by favorites Botswana, who in fact clocked a slower time than India (3.05.01 seconds) while Kenya and Fiji finished second and third with a time of 3.13.52seconds and 3.19.19 seconds. With India having qualified second for the final, with the second fastest time, the team, helmed by national record holder Mohammad Anas, would be expected to finish on the podium. The Indian 4x400m women’s team comprising MR Poovamma, Saritaben Gayakwad, Soniya Baishya and Hima Das will also look for a podium finish in the finals tomorrow. With just eight teams entering the competition, there were no qualifying heats for this event on Friday. India capped the day with a bit of good news. Purnima Hembram finished seventh in the women’s heptathlon but managed to finish with a new personal best. Hembram added 837 points in the long jump with a leap of 5.96m, 697 points with a best effort of 41.57m in the javelin throw and 859 points in the women’s 800m with a time of 2.17.44 seconds. Hembram finished with a total of 5834 points to finish in 7th place in a tough group. Meanwhile in men’s triple jump final on Saturday, India’s hopes rest with Arpinder Singh who qualified for the finals earlier on Wednesday.